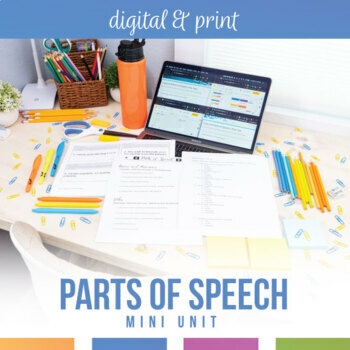 Study the eight parts of speech! This grammar unit includes a pre-test, a post-test, and 32 sentences on task cards and in worksheet format. They review nouns, verbs, pronouns, adjectives, adverbs, prepositions, conjunctions, and interjections. This grammar lesson provides practice for students to identify the eight parts of speech. Everything except for the task cards is editable! • 32 sentences, one per task card. Four task cards per page. The sentences have a word highlighted, and student directions prompt them to label it. • A student answer sheet for the task cards. 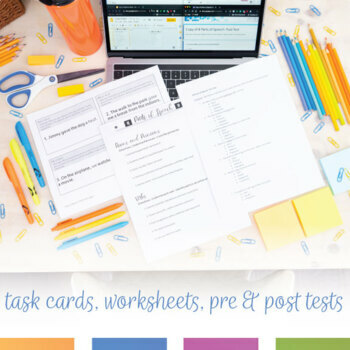 • All of the sentences in worksheet format - use the worksheet or task cards - or both! This section is completely editable. * 10 sentences for a pre-test. The quiz is editable as well. * 15 sentences for a post-test. The quiz is editable as well. Study the eight parts of speech with over 50 practice sentences! This product is in a bundle. 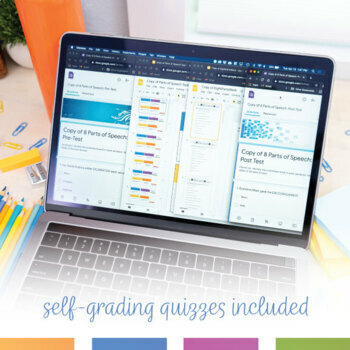 For a discounted rate, check out the Sixth Grade Grammar Bundle.